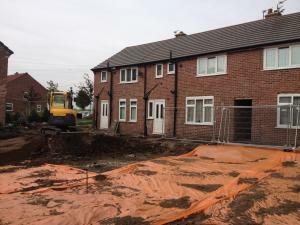 VertaseFLI was contracted by AMEC on behalf of St Helens Council to undertake remediation works on a site in St Helens comprising six residential properties designated as ‘Contaminated Land’ under Part 2A of the Environmental Protection Act 1990. Remediation of six Part 2A gardens, excavation and disposal of contaminated soils, import of sub / topsoil and reinstatement of areas of soft landscaping, construction of hardstanding, installation of drainage runs. The work involved the excavation of garden areas to a depth of 600mm. 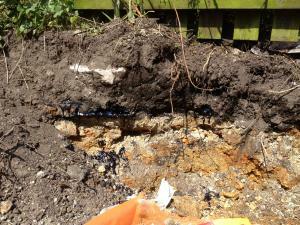 Contaminated material was disposed offsite as either Hazardous or Non Hazardous to an appropriately licenced facility. Prior to reinstatement of clean materials, an orange geotextile marker membrane was installed as a no dig layer. Gardens were then reinstated via the import of 600mm of clean fill, typically comprising 450mm of subsoil and 150mm of topsoil or an appropriate surface finish such as Flags, gravel, turf or planting areas, thus providing a pathway break. All imported materials were tested at source in accordance with the AMEC specification prior to import. Other associated works involved the rebuilding of stone walls, brick outhouses wooden sheds, pathway edgings and the preservation of existing live services. The remediation of the site presented a number of significant challenges due to restricted access and working conditions within the gardens. Works were undertaken in close consultation with the householders under an accelerated programme in order to minimise disruption. VertaseFLI worked closely with St Helens Council to meet the requests of the residents. The project demonstrates our ability to contribute positively on often contentious works and to the satisfaction of all stakeholders.